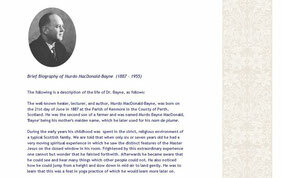 The well-known healer, lecturer, and author, Murdo MacDonald-Bayne, was born on the 21st day of June in 1887 at the Parish of Kenmore in the County of Perth, Scotland. He was the second son of a farmer and was named Murdo Bayne MacDonald, 'Bayne' being his mother's maiden name, which he later used for his nom de plume. During the early years his childhood was spent in the strict, religious environment of a typical Scottish family. We are told that when only six or seven years old he had a very moving spiritual experience in which he saw the distinct features of the Master Jesus on the closed window in his room. Frightened by this extraordinary experience one cannot but wonder that he fainted forthwith. Afterwards he became aware that he could see and hear many things which other people could not. He also noticed how he could jump from a height and slow down in mid-air to land gently. He was to learn that this was a feat in yoga practice of which he would learn more later on. Unfortunately, it was about this time in his boyhood while he was out in the fields with his brother and having jumped over a brook he came down onto some barbed wire and one of the barbs penetrated his left eye. It was in hospital that his surgeon uncle had to operate on him to remove the eye and he always wore a glass eye from then on. He entered the medical field when a young man with plans on studying to become a doctor. Following a few years of applying himself to serious study he came to the conclusion that the medical profession in general was basically too involved in the materialistic side. He said years later that although he came to appreciate the time spent in medical studies, he felt and knew that Life was a living thing and not a dead thing as the medical profession would have us believe. He then dropped out of medical studies and began to pursue a more enlightened path which at the time involved health and healing. In 1913 he married and two sons were born of this union. When war was declared in 1914 he enlisted at Aldershot into The Highland Light Infantry as of November 12, 1915, and remained with this unit for the duration of the war. Since he was a very good piper he was assigned to the position of Pipe Major. On June 9, 1917 he was transferred to the Labour Corps (Sergeant); on September 16, 1917 he was appointed to a commission as Temporary 2nd Lieutenant, Labour Corps; in 1919 he was appointed on March 16 as Temporary Lieutenant and was released from military service as of October 5, 1920 when he relinquished his commission, retaining the rank of Lieutenant. His wartime medals were: British War Medal, Victory Medal, Military Cross (London Gazette [Supplement] of 22.6.18). Dr. MacDonald-Bayne has related in his lectures how at the battle of Somme he was badly wounded and left for dead on the battlefield for four days. This is what he said: " During that period of time spent 'on the other side' I was instructed to return to my physical body, for my work was to tell the Truth to the world. When they came to remove the corpses for burial in a mass grave, one of the ambulance men heard my groan and said, 'There's a live one here!' I was brought to the medical field station and immediately operated on. I heard distinctly the doctor mentioning that there was a possibility of losing the other eye and I decided in myself that was not going to happen. During the whole operation I was aware of what was taking place, although unable to speak, for one of the wounds was in the throat. So, out of the body I assisted at this operation. After recovery and convalescence, I rejoined the Forces and went through the Near East Campaign." After his demobilization in 1920 he moved with his family to Australia for a time. When the children grew older it became necessary for Mrs. MacDonald-Bayne to return to England for their education. It was around this time that Dr Bayne started his Healing Campaign and toured some 23 countries, giving lectures, which also included the subject of Voice Development, or speaker training, due to this having been a therapy he underwent on being wounded in the war when he was shot in the throat by a silver bullet, an incident which he describes in his recorded lecture on tape, “Life More Abundant.” Wherever he went it was his mission to teach and to heal. In these early years he taught more along the line of psychology which is based on the theory that what you want and visualize, you will eventually get, even if it is not suitable for your development. However, it was to be at another stage of his life that he would make several journeys to India and Tibet and his attitudes would change after he had studied and mastered the many forms of yoga and became very skilled in meditation and concentrated breathing. A number of these exercises are detailed in his books and recordings. The College Of Universal Science was founded by Dr Bayne in Manchester, England, during the early 1930s and it was here that he began to teach Metaphysics. It was during a séance held in Edinburgh that he received a spiritual message to, “Go to South Africa" where there was much spiritual work for him to do, “South Africa needs you there.” He was accompanied by his sister-in-law, Mrs. Chisholm, who took charge of the household duties since Dr Bayne’s wife and children continued to remain in England. It was in the mid-1930s that Dr Bayne arrived and first established a centre for healing in Cape Town. At this time he was given further spiritual direction which advised him to go to Tibet. Due to his deep commitment to spiritual study and a tireless devotion to seeking out greater knowledge and understanding he pursued the directive given and left immediately, journeying through India and onward to the Himalayas. In his two last books, Beyond the Himalayas and The Yoga of the Christ, Dr Bayne details many of his experiences of risking his life at times when travelling through dangerous areas and crossing treacherous waters on narrow paths. He describes how he spent time in practising the advanced instructions he received from living Masters and this became the basis for his later teachings. He visited many lamaseries and witnessed extraordinary feats performed by adepts which would be almost impossible to explain to an ordinary man’s thinking. He developed his abilities in telepathy, in tumo, in leaving the body at will (astral projection) as well as mastering pranayama and acquiring profound knowledge of the Eternal through lengthy meditations lasting for several days. After re-entering the civilized world, Dr. Bayne continued to establish further centres in the Commonwealth countries as well as Canada and the United States. Even today, there are people in various countries who still remember his talks and healing sessions. I can recall one lady I spoke to in Canada who remembered attending Dr Bayne’s lectures during his travels so many years ago. And there was a health practitioner in USA I corresponded with for a while, upwards in his 90s, who was taught healing methods by Dr Bayne. Further added to this period of constant travel Dr Bayne was again instructed to return to South Africa and it was there that one of his former students, Mr. Andrew Hutt, formally introduced Dr Bayne to a public gathering held in Escom Auditorium, Johannesburg, in 1944. This was where he established his centre, the College of Universal Science and the Sanctuary of The Silent Healing Power, which sent out monthly letters to subscribers worldwide. It wasn’t long before he became very well known, lecturing twice a week, Thursdays in Johannesburg and in Pretoria on Tuesdays, all the while continuing his daily healing work. His Monthly Letters, now available in Books 1, 2, and 3, and published by MacDonald-Bayne Publications in Canada, were distributed worldwide bringing much help and guidance to many. It was in the mid 1940's that his talks began to be preserved on wire recordings and these too are available on tape from MacDonald-Bayne Publications in Canada. No one was ever refused help and many were aided in various ways as his powers of healing even at a distance through astral projection were well known and verified by many. He would appear at the bedside of a person who had asked for help, for he was able, as said before, to leave his body at will and appear at any place where needed. With the help of his spiritual teachers and the Masters of Tibet he did achieve some remarkable results, some will say 'miraculous’ healings. Let me relate some of these happenings. . . .